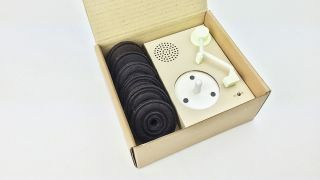 Hong Kong and Taiwan-based Design Agency Dimension Plus have created Oreo Vinyl, a project which takes the humble Oreo Cookie and turns it into a music playing device. It’s unclear if any record companies will be pursuing the cookie option for future releases, or if fans will be ditching the vinyl collections they accumulated to replace the CDs they purchased to replace their original vinyl collections, and replacing them with Oreos. Mötley Crüe/Def Leppard: "More tea and biscuits than JD and heroin."